TriThis has been released for Unity! This package allows you to generate meshes based on grid based, procedurally generated (level) content. Included in this package is a set of algorithms that can transform grid based level content into 3D meshes. 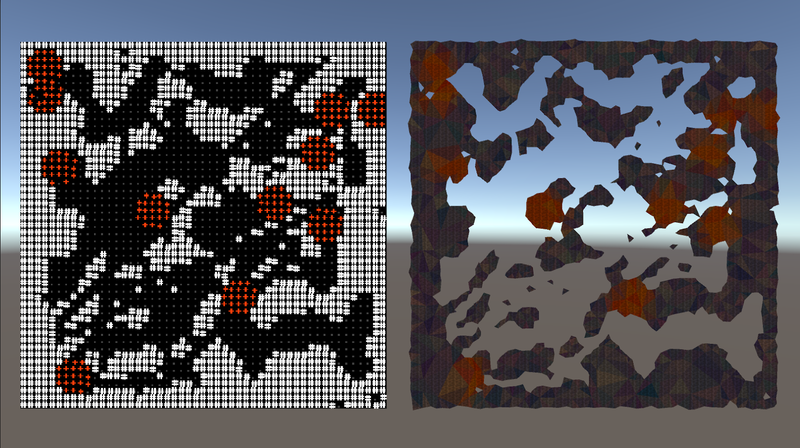 By defining which cells in your grid are solid, the algorithm defines the edges of "chunks" (groups of connected solid cells) and creates contours for them. These contours are then used to create a mesh. The colors of this mesh are dependent on the type of cells, and are customizable. The package also offers two examples. One is a very basic example that reads level data from a file, puts this in a grid, and then creates the meshes. 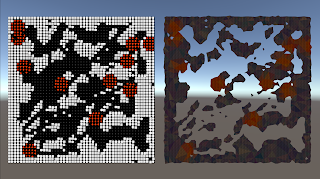 The other is an example of how this package can be used with other procedural generation packages, such as ProD. All that is needed is a simple conversion of the grid so that it can be read by our algorithm, and the rest happens automatically. This example does require ProD to function though, so if you do not have it, you should not import this example scene. Edit: The package can be downloaded here. Thanks Ies! Edit: For more convenience, the quickstart and documentation can be downloaded here.